Flagship Korean luxury sedan gets stretched and strengthened for debut at Moscow International Automobile Salon. A luxurious cabin is all fine and well, but for wealthy individuals in some of the world&apos;s more violent areas, the ultimate luxury is safety. In those markets armored cars are big business, and now Hyundai is getting into the game with the Equus Limousine Security. Built by a joint effort between Hyundai and German specialist ArmorTech, the fortress-like sedan has been stretched and strengthened specifically for customers looking for that added dose of security. Already a fairly large vehicle, this Equus has been lengthened to 5.46 meters - a good foot longer than stock. It has also been fitted with a bullet-proof body shell, windows and a "labyrinth" matrix around the panel gaps. 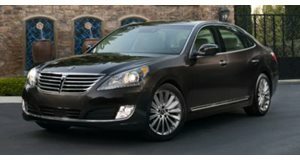 To help move the extra weight that comes with enlarging and reinforcing a vehicle like the Equus, Hyundai has also increased the output of the 5.0-liter V8 engine from 400 horsepower to 430. The result is certified to VR7 ballistic protection levels by Germany&apos;s Beschussamt Mellrichstadt certification agency and will be unveiled to the public at the Moscow International Automobile Salon in just a few days from now.